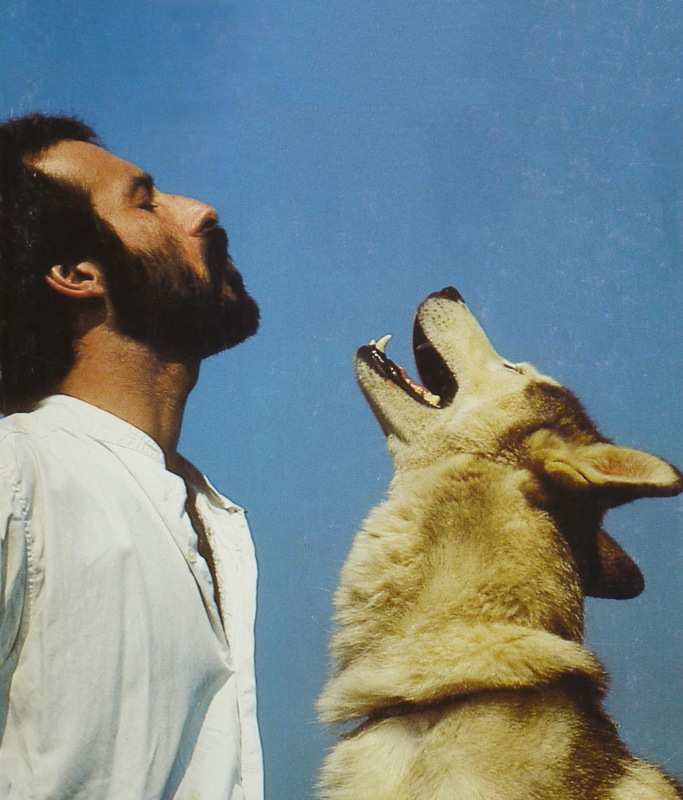 Cover photo from the author’s book from 1986 “Hunden, vor ven” (The Dog, Our Friend) (photo by Ole Suszkievicz). 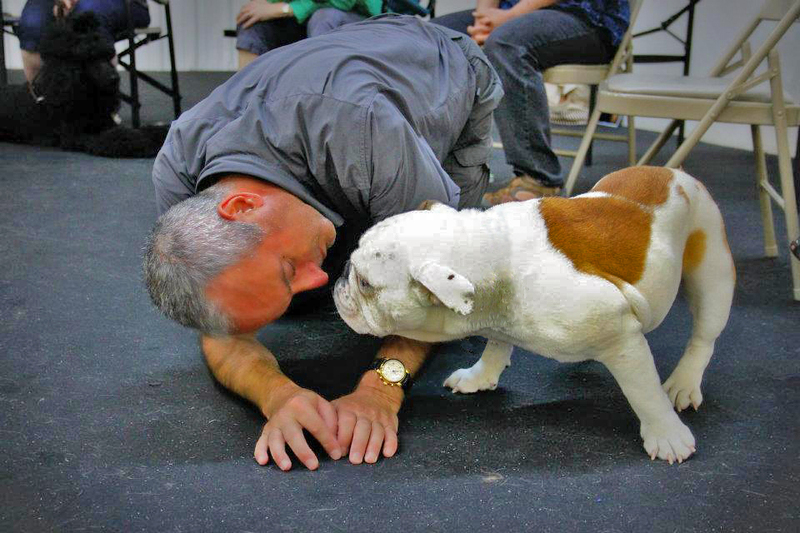 Dog Training—Let Reason Prevail Over Force! “Whether you (or I) follow a particular line of morality is not a necessary consequence of any model of social behavior. Moral stances are solely your (or my) decision” (Picture by Lisa J. Bains). The dog trainers’ dispute about training methods blazes on unabated, with the erroneous and emotive use of terms such as dominance, punishment and leadership only adding fuel to the fire. There is no rational argumentation between the two main factions, one of which advocates a “naturalistic” approach and the other a “moralistic” stance. The term ‘dominance’ generates particular controversy and is often misinterpreted. We can detect, in the line of arguing about this topic, the same fundamental mistakes committed in many other discussions. By taking the controversy over dominant behavior as my example, I shall attempt to put an end to the feud by proving that neither side is right and by presenting a solution to the problem. Plus ratio quam vis—let reason prevail over force! (1) Blurring the boundaries between science and ethics. While ethics and morality deal with normative statements, science deals with factual, descriptive statements. Scientific statements are not morally right or wrong, good or bad. (2) Unclear definitions. We cannot have a rational discussion without clear definitions of the terms used. Both sides in the dispute use unclear, incomplete definitions or none at all. (3) Logical fallacies. The opposing sides commit either the ‘naturalistic fallacy,’ ‘the moralistic fallacy,’ or both. We cannot glean normative statements from descriptive premises, nor can we deduce facts from norms. The fact that something is does not imply that it ought to be; conversely, just because something ought to be does not mean that it is. (4) Social conditioning and emotional load. As a result of inevitable social conditioning and emotional load, some terms develop connotations that can affect whether we like or dislike, accept or reject them, independent of their true meaning. (5) Unclear grammar. The term dominance (an abstract noun) leads us to believe it is a characteristic of certain individuals, not an attribute of behavior. The correct use of the term in the behavioral sciences is as an adjective to describe a behavior, hence dominant behavior. Bottom line: We need to define terms clearly and use them consistently; otherwise rational discussion is not possible. We must separate descriptive and normative statements, as we cannot derive what is from what ought to be or vice versa. Therefore, we cannot use the scientific concept of dominant behavior (or any descriptive statement) to validate an ethical principle. Our morality, what we think is right or wrong, is a personal choice; what is, or is not, is independent of our beliefs and wishes (we don’t have a choice). Solution to the problem: The present dispute focuses on whether we believe it is right or wrong to dominate others (as in, totally control, have mastery over, command). It is a discussion of how to achieve a particular goal, about means and ends. It is a moral dispute, not a scientific quest. If both sides have similar goals in training their dogs, one way of settling the dispute is to prove that one strategy is more efficient than the other. If they are equally efficient, the dispute concerns the acceptability of the means. However, if either side has different goals, it is impossible to compare strategies. My own solution of the problem: I cannot argue with people who believe it is right to dominate others (including non-human animals) as, even though I can illustrate how dominating others does not lead to harmony, I can’t make anyone choose harmony or define it in a particular way. I cannot argue with people who think it acceptable to hurt others in order to achieve their goals because such means are inadmissible to me. I cannot argue with people who deny or affirm a particular matter of fact as a means of justifying their moral conduct, because my mind rejects invalid, unsound arguments. With time, the rational principles that govern my mind and the moral principles that regulate my conduct may prove to be the fittest. Meanwhile, as a result of genetic pre-programming, social conditioning and evolutionary biology, I do enjoy being kind to other animals, respecting them for what they are and interacting with them on equal terms; I don’t believe it is right to subjugate them to my will, to command them, to change them; and I don’t need a rational justification as to why that’s right for me*. “I do enjoy being kind to other animals, respecting them for what they are and interacting with them on equal premises; I don’t find it right to subjugate them to my will and dispositions, to command them, to change them; and I don’t need a rational justification for why that’s right for me” (Picture by Lisa J. Bain). There are five legitimate criteria when evaluating a scientific theory or model: (1) evidence, (2) logic, (3) compatibility, (4) progression, and (5) flexibility. (1) Evidence: a scientific theory or model must be based on credible and objective evidence. If there is credible evidence against it, we dismiss it. It must be testable and falsifiable. (2) Logic: If a theory or model is based on logically invalid arguments or its conclusion are logically unsound, e.g. drawing valid conclusions from false premises, we must also dismiss it. (3) Compatibility: If a theory or model shows crucial incompatibility with the whole body of science, then it is probably incorrect. If it is incompatible with another model, then we have a paradox. Paradoxes are not to be discarded, instead worked on and solved (or not solved as the case may be). Since “Paradoxes do not exist in reality, only in our current models of reality, […] they point the way to flaws in our current models. They therefore also point the way to further research to improve those models, fix errors, or fill in missing pieces.” In short, “scientists love paradoxes,” in the words of Novella. (4) Progression: A scientific theory or model must explain everything that has already been explained by earlier theories, whilst adding new information, or explaining it in simpler terms. (5) Flexibility: A theory or model must be able to accept new data and be corrected. If it doesn’t, then it is a dogma, not a scientific theory. A dogma is a belief accepted by a group as incontrovertibly true. Science provides facts and uncovers important relationships between these facts. Science does not tell us how we should behave or what we ought to do. 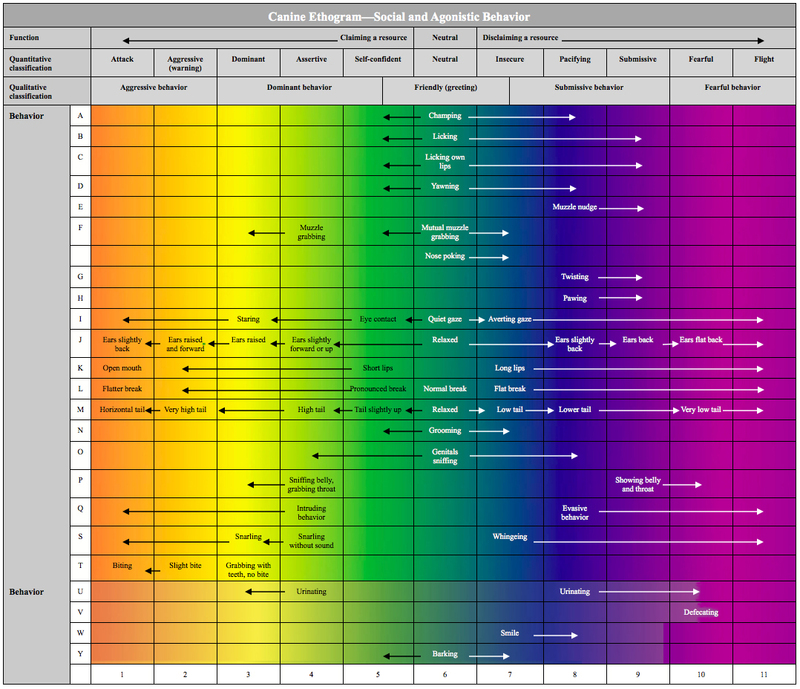 Science is descriptive, not normative. In other words: we decide what is right or wrong, good or bad, not necessarily depending on what science tells us. Morality and science are two separate disciplines. I may not like the conclusions and implications of some scientific studies, I may even find their application immoral; yet, my job as a scientist is to report my findings objectively. Reporting facts does not oblige me to adopt any particular moral stance. The way I feel about a fact is not constrained by what science tells me. I may be influenced by it but, ultimately, my moral decision is independent of scientific fact. Science tells me men and women are biologically different in some aspects, but it does not tell me whether or not they should be treated equally in the eyes of the law. Science tells me that evolution is based on the algorithm “the survival of the fittest,” not whether or not I should help those that find it difficult to fit into their environment. Science informs me of the pros and cons of eating animal products, but it does not tell me whether it is right or wrong to be a vegetarian. Ethologists study behavior on a biological and evolutionary basis, define the terms they use, find causal relationships, construct models for the understanding of behavior and report their findings. Ethologists are not concerned with morality. They simply inform us that the function of x behavior is y. They don’t tell us that because animal x does y, then y is right or wrong, good or bad, or that we ought or ought not do y. The model I present in “Dominance—Making Sense of the Nonsense” is a scientific model that complies with all five of the requirements listed above. (1) It is based on overwhelming data, i.e. given my definition of ‘dominant behavior,’ one cannot argue that it does not exist. (2) The conclusions are logically consistent with the premises. (3) It is consistent with our body of knowledge, particularly in the fields of biology and evolutionary theory. (4) It explains what has been explained before and in more carefully defined terms. (5) It accepts new data, adjustments and corrections (the current version is an updated version of my original from 1986). The model tells us nothing about morality. No single passage suggests that we should classify any particular relationship with our dogs as morally right or wrong. You will have to decide that for yourself. As an ethologist, I’m not concerned with what ought to be, only with what is. Echoing Satoshi Kanazawa, if I conclude something that is not supported by evidence, I commit a logical fallacy, which I must correct, and that’s my problem, but if my conclusion offends your beliefs, then that’s your problem. Therefore, whether you (or I) follow a particular line of morality is not a consequence of any model of social behavior. Moral stances are solely your (or my) decision. It is not correct to draw normative judgments from descriptive claims. If you do so, you either commit the ‘naturalistic fallacy,’ the ‘moralistic fallacy’ or both, as I shall explain below (see point 3). Having just pointed out the rigors of science, I must concede that the scientific community does bear some responsibility for the present dispute in as much as definitions and use of terms have sometimes been sloppy. Some researchers use particular terms (in this case ‘dominance’) without defining them properly and with slightly different implications from paper to paper. Wikipedia writes: “Dominance (ethology) can be defined as an ‘individual’s preferential access to resources over another’ (Bland 2002). Dominance in the context of biology and anthropology is the state of having high social status relative to one or more other individuals, who react submissively to dominant individuals. This enables the dominant individual to obtain access to resources such as food or access to potential mates, at the expense of the submissive individual, without active aggression. The opposite of dominance is submissiveness. […] In animal societies, dominance is typically variable across time, […] across space […] or across resources. Even with these factors held constant, perfect dominant hierarchies are rarely found in groups of any size” (Rowell 1974 and Lorenz 1963). Firstly, defining ‘dominance’ instead of ‘dominant behavior’ seems somewhat imprudent for a science that is intrinsically based on observational facts. It suggests we are dealing with an abstract quality when in fact we are referring to observable behavior (see point 5 below). Secondly, it implicitly equates ‘dominance’ with hierarchy (social status), which is misleading because some hierarchies may be supported by conditions other than dominant behavior. The use of the term ‘dominance hierarchy’ creates a false belief. Clearly, the terms dominance and dominant behavior are attributed with varying meanings, a highly unadvisable practice, particularly in stringently scientific matters. To remedy this, I propose in “Dominance—Making Sense of the Nonsense” a set of carefully constructed definitions that are compatible with behavioral science and evolutionary theory, whilst paying special attention to the logical validity and consistency of the arguments. I’m convinced that we would avoid many pointless disputes if all those dealing with the behavioral sciences were to adopt such definitions. 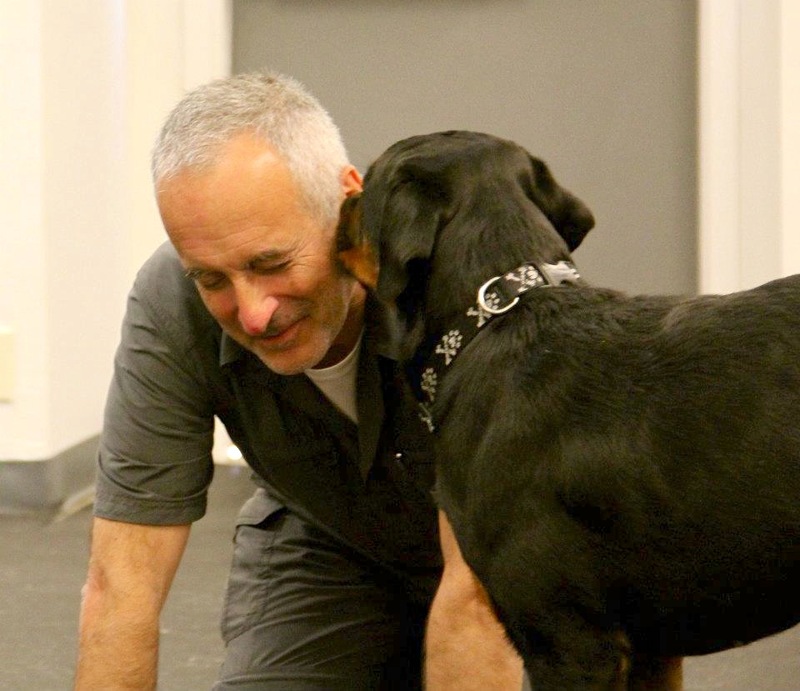 Roughly speaking, there are currently two main schools of thought in dog training. For our present purpose, we shall call them ‘Naturalistic Dog Training’ and ‘Moralistic Dog Training.’ Of course, there are various other stances in between these two extremes, including a significantly large group of bewildered dog owners who do not adhere to any particular ideology, not knowing which way to turn. 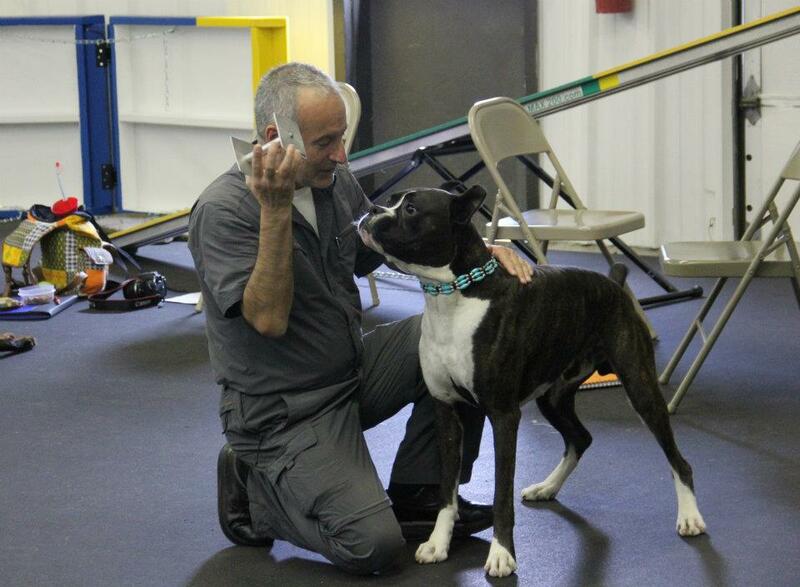 Naturalistic Dog Training (aka the old school) claims their training echoes the dog’s natural behavior. They don’t provide a proper definition of dominance, but use it with connotations of ‘leader,’ ‘boss,’ ‘rank,’ implying that dominance is a characteristic of an individual, not of a behavior. In their eyes, some dogs are born dominant, others submissive, but all dogs need to be dominated because their very nature is to dominate or be dominated. They use this belief to justify their training methods that often involve punishment, flooding, coercion, and even shock collars, if deemed necessary, by the more extreme factions. For them, a social hierarchy is based on (assertive) dominance and (calm) submission, the leader being the most dominant. Their willingness to accept the existence of dominant behavior is motivated by their desire to validate their training theories, but their interpretation of the term is far from what ethologists understand by it. Moralistic Dog Training (aka positive reinforcement training) distances itself from punishment, dominance, and leadership. They don’t define ‘dominance’ properly either, but use it with connotations of ‘punishment,’ ‘aggression,’ ‘coercion,’ ‘imposition.’ They claim dominance does not exist and regard it as a mere construct of philosophers and ethologists aimed at justifying the human tendency to dominate others. Their view is that we should nurture our dogs as if they were part of our family and should not dominate them. Therefore, they also distance themselves from using and condoning the use of terms like ‘alpha,’ ‘leader’ and ‘pack.’ The more extreme factions claim to refrain from using any aversive or signal that might be slightly connected with an aversive (like the word ‘no’) and deny their using of punishers (which, given the consensually accepted scientific definition of punishment, is a logical impossibility). Their refusal to accept the existence of dominant behavior is motivated by their desire to validate their training morality, but their interpretation of the term is again far from what ethologists understand by it. This is a descriptive statement, a classification of a class of behaviors, so we can distinguish it from other classes of behaviors, based on the observable function of behavior (according to evolutionary theory). It is clearly distinguishable from the statements of both opposing mainstream dog-training groups in that it does not include any normative guidance. A logical fallacy is unsound reasoning with untrue premises or an illogical conclusion. Logical fallacies are inherent in the logic structure or argumentation strategy and suit irrational desires rather than actual matters of fact. It has two invalid forms (affirming the consequent and denying the antecedent). “There is no evidence that dogs attempt to dominate others or that they don’t. On the contrary, all evidence suggests that dogs (as most animals) use different strategies depending on conditions including costs and benefits. Sometimes they display dominant behavior, other times they display submissive behavior, and yet other times they display some other behavior” Picture by (L’Art Au Poil École). We cannot derive ‘ought’ from ‘is.’ Arguments 1a and 1b commit the ‘naturalistic fallacy.’ Both arguments seem formally valid, except that they derive a norm from a fact. There is no logical contradiction in stating, “I ought not to train dogs according to their nature.” They are also unsound (the conclusions are not correct) because premises P are not true. There is no evidence that dogs attempt to dominate others or that they don’t. On the contrary, all evidence suggests that dogs (like most animals) use different strategies depending on conditions, which include costs and benefits. Sometimes they display dominant behavior, other times they display submissive behavior, and other times they display other behavior. Even when particular dogs are more prone to use one strategy rather than another, we are not entitled to conclude that this is the nature of dogs. 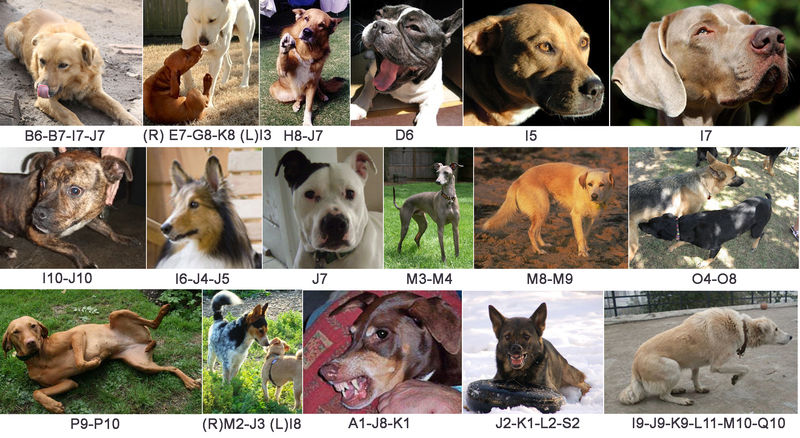 Conclusion: whether science proves that dogs display or don’t display dominant behavior has nothing to do with whether or not it is morally right for us to dominate our dogs. We cannot derive ‘is’ from ‘ought.’ Arguments 2a and 2b commit the ‘moralistic fallacy.’ Argument 2a is formally invalid even if the premises were true because the conclusion is not entailed in the premises (it is the same as saying red is a color, blood is not a color, so blood is not red). Argument 2b sounds a bit odd (in this form), but it is the only way I have found of formulating a valid argument from the moralistic trainers’ argument. It is formally valid but it is unsound because it commits the moralistic fallacy: in its second line, it derives a fact from a norm. It assumes that nature doesn’t do wrong (or what is good is natural), but there is no contradiction in assuming the opposite. Conclusion: the fact we believe it is morally wrong to dominate our dogs does not mean that dogs do not display dominant behavior. We are entitled to hold such a view, but it does not change the fact that dogs display dominant behavior. All words we use have connotations due to accidental social conditioning and emotional load. A scientist knows he** cannot afford his judgment to be clouded by his own accidental social conditioning or emotions. A defined term means that and only that. It’s not good, not bad, not right, not wrong, and the issue of whether he likes it or not does not even enter the equation. As an individual he may have his own personal opinion and moral viewpoint, but he does not allow them to affect his scientific work. As individuals, we all have our own likes and dislikes because we are constantly being conditioned by our environment. Culture, trends, movements, environments, relationships and moods, all bias our attitudes towards particular terms. Nowadays, for reasons I will leave to historians and sociologists to analyze, the words ‘dominance’ and ‘submission’ have negative connotations for many people. When people, all of whom are subject to social conditioning, fail to distinguish between the scientific meaning of the words and their everyday connotations, they repudiate them, which is understandable. Another problem is that we use the word dominance as a noun (an abstract noun in contrast to a concrete noun) when in this case it is (or should be) a ‘disguised adjective.’ Adjectives don’t make sense without nouns (except for adjectival nouns). Dominance is an abstract noun, something that by definition does not exist (otherwise it wouldn’t be abstract), except as an abstract notion of ‘showing dominant behavior’ and as in ‘dominant allele,’ ‘dominant trait,’ ‘dominant ideology,’ ‘dominant eye,’ etc. However, the behavior of alleles, traits, ideologies and eyes, which we call dominant or classify as dominant, exists. For example, the question “Do dogs show dominance towards humans?” uses the abstract noun ‘dominance’ as an adjectival noun instead of the more correct ‘dominant behavior’. This can be confusing for some as it suggests that dominance is an intrinsic quality of the individual, not the behavior. Therefore, I suggest that, in the behavioral sciences, we henceforth drop the adjectival noun and only use the term as an adjective to behavior. This is a very important point and a source of many misunderstandings and misconceptions regarding the character of behavior. Behavior is dynamic and changeable. An individual displays one behavior at one given moment and another a while later. The popular view maintains the notion of a ‘dominant individual’ as the one that always shows dominant behavior and the ‘submissive individual’ as the one that always shows submissive behavior, which is not true. Dominant and submissive (dominance and submission) are characteristics of behavior, not individuals. Individuals may and do change strategies according to a particular set of conditions, although they may exhibit a preference for one strategy rather than another. It is the ability to adopt the most beneficial strategy in the prevailing conditions that ultimately sorts the fittest from the less fit—moral strategies included. * This is my normative judgment and as such no one can contest it. ** The most correct form would be ‘he/she,’ or ‘he or she,’ but since I find it extremely ugly from a linguistic point of view (my normative judgment) to use this expression repeatedly, I chose to write, ‘he’ though not by any means neglecting the invaluable and indisputable contribution of my female colleagues. Abrantes, R. 1986. The Expression of Emotions in Man And Canid. Waltham Symposium, Cambridge, 14th-15th July 1986. Abrantes, R. 1997. The Evolution of Canine Social Behavior. Wakan-Tanka Publishers (2nd ed. 2005). Abrantes, R. 2011. Dominance—Making Sense Of The Nonsense. Ayer, A. J. 1972. Probability and Evidence. Macmillan, London. Bekoff, M. & Parker, J. 2010. Wild Justice: The Moral Lives of Animals. Univ. Of Chicago Press. Bland J. 2002 About Gender: Dominance and Male Behaviour. Copi, I. M. and Cohen, C. 1990. Introduction to Logic (8th ed.). Macmillan. Dennet, D. 1996. Darwin’s Dangerous Idea: Evolution and the Meanings of Life. Simon & Schuster. Dennet, D. 2003. Freedom Evolves. Viking Press 2003. Futuyma, D. J. 1979. Evolutionary Biology. Sinauer Assoc. Galef, J. 2010. Hume’s Guillotine. Hewitt, S. E., Macdonald, D. W., & Dugdale, H. L. 2009. Context-dependent linear dominance hierarchies in social groups of European badgers, Meles meles. Animal Behaviour, 77, 161-169. Hume, D. 1739. A Treatise of Human Nature. Oxford University Press, Oxford, 1967, edition. Kanazawa, S. 2008. Two Logical Fallacies That We Must Avoid. Kierkegaard, S. 1844. Philosophiske Smuler eller En Smule Philosophi (Philosophical Fragments). Samlede Værker, Nordisk Forlag, 1936. Lorenz, K. 1963. Das sogenannte Böse. Zur Naturgeschichte der Aggression. Wien, Borotha-Schoeler Verlag, 1969. Moore, E. C. 1957. The Moralistic Fallacy. The Journal of Philosophy 54 (2). Moore, G. E. 1903. Principia Ethica. Novella, S. 2012. The Paradox Paradox. Pinker, S. How the Mind Works. New York: W. W. Norton & Company, 1997. Popper, K. 1963. Conjectures and Refutations. Routledge and Kegan Paul, London, UK. Popper, K. Objective Knowledge: An Evolutionary Approach. Oxford University Press. Rachels, J. 1990. Created From Animals. Oxford University Press. Rowell, T. E. 1974. The Concept of Social Dominance. Behavioral Biology, 11, 131-154. Ruse, M. 1986. Taking Darwin seriously: a naturalistic approach to philosophy. Prometheus Books. Thanks to Anabela Pinto-Poulton (PhD, Biology), Simon Gadbois (PhD, Biology), Stéphane Frevent (PhD, Philosophy), Victor Ross (Graduate Animal Trainer EIC), Parichart Abrantes (MBA), and Anna Holloway (editor) for their suggestions to improve this article. The remaining flaws are mine, not theirs. Foto de la portada del libro del autor de 1986 “Hunden, vor ven” (“El Perro, Nuestro Amigo”) (foto de Ole Suszkievicz). “16 Things You Should Stop Doing In Order To Be Happy With Your Dog” traducido del Inglés por Victor Ros. Aquí tienes una lista de 16 cosas que debería dejar de hacer para tener una vida con tu perro más feliz y una relación más fuerte. ¿Difícil? Para nada. Sólo necesitas querer hacerlo y, a continuación, simplemente hacerlo. Puede comenzar tan pronto como termines de leer esto. Como la mayor parte de cosas en la vida, ser un perfeccionista tiene sus ventajas y desventajas. Cuando posees un perro, tiendes a vivir según la Ley de Murphy. Cualquier cosa que puede ir mal irá mal. Hay tantos variables que las cosas rara vez van 100% la manera esperada. Puedes y debes planear y entrenar, pero tienes que estar preparado para aceptar todo tipo de variaciónes, improvisaciones y pequeños percances a lo largo del camino, siempre que nadie se haga daño, por supuesto. ¿Después de todo, en la mayor parte de situaciones, menos que perfecto es mejor que bueno, entonces, por qué la preocupación sobre la perfección, un concepto que sólo existe en tu cabeza y no hace a nadie feliz, ni a ti, ni a tu perro? Si no tienes buen sentido del humor, no vivas con un perro. Ser propietario de perro da ocasión a contratiempos donde la risa es la mejor salida. Los contratiempos sólo son embarazosas en nuestras mentes. Tu perro no sabe siquiera lo que quiere decir verguenza, deberias seguir su ejemplo. Mientras nadie se haga daño, riete de los errores que cometeis tu y tu perro. Cuando la vida con un perro es a menudo dictada por la ley de Murphy, si intenta controlar cada movimiento de tu perro, acabara con una úlcera o caeras en una depresión. Renuncie tu necesidad de control. Por supuesto, debe tener un control razonable sobre tu perro por razones de seguridad, pero debe dejar ir todo aquello que no es una cuestión de vida o muerte. Reglas razonables sirven un propósito, pero el control total es innecesaria y contraproducente. Tomarlo como viene y seguir sonriendo! Cuando las cosas van mal, y lo harán, les aseguro, no pierda el tiempo repartiendo culpas. ¿Fue tu culpa, culpa del perro, o culpa del gato del vecino? ¿A quién le importa? Sigue adelante aunque toda la escena te produjo tristeza, intenta prever una situación similar en el futuro y como evitarlo. Si no ha sido gran cosa, olvidate del asunto. El mundo está lleno de cuentos de viejas, irracionales y sin fundamento. Hoy día, el Internet nos proporciona rápido y fácil acceso a mucha información valiosa—y tambien un montón de basura: malos argumentos, malas definiciones, reclamaciones infundadas, falacias, estados emocionales, pseudociencia, promociones de ventas, agendas políticas ocultas, predicaciónes religiosos, etc… Por supuesto, en nombre de la libertad de expresión, creo todos deberían poder publicar cualquierles gusta, incluso la bazofia más pura y más refinada, pero tanto yo como tu también tenemos el derecho a no creernoslo, haciendo caso omiso de ello. Utilice tu pensamiento crítico. No deje de preguntar “¿Cómo puede ser?” y “¿Cómo llegó a esa conclusión?” Suspende el juicio y la acción hasta que hayas tenido tiempo para reflexionar, si es necesario, busca una segunda o tercera opinión. Si el argumento es sólido y le gusta, entonces hágalo. Si el argumento es sólido pero no te gusta, no hacerlo y pensar más sobre ello. Si el argumento es poco sólido, rechazalo y no pienses más sobre ello. Convencete a ti mismo y haz lo que piensas es correcto. Estamos sobre-inundados por las etiquetas porque las etiquetas venden, pero sólo venden si los compramos. ¿Deberias ser positivo, ultra-positivo, R+, R++, R+ P-, equilibrado, naturalista, moralista, conservador, realista, progresivo, o dueño clickeriano o autoritario del perro? Deje de preocuparte sobre qué etiqueta debe portar. Cuando disfrutas de un gran momento con tu perro, la etiqueta que llevas es irrelevante. Una etiqueta es una carga; te restringe y te quita tu libertad. Las etiquetas son para personas inseguras que necesitan esconderse detrás de una imagen. Cree en ti mismo, sea el tipo de propietario de perro que quieres ser y no necesitará etiquetas. Pasas muy poco tiempo con la mayoría de la gente que conoces, significativamente más con la familia y amigos cercanos, pero vives toda la vida contigo mismo. Así que, ¿qué importa lo que otras personas piensan acerca de su habilidad como propietario de perro, o del comportamiento de tu perro, cuando es probable que no les veas de nuevo o sólo les veremos esporádicamente? Si les gusta tu y tu perro, bien. Si no, realmente no es tu problema. Sólo tienes un problema cuando hay una discrepancia entre la forma en que las cosas son y lo que esperas que sean. Si tus expectativas son realistas, probar de hacer algo para alcanzarlas. Si no lo son, deja de quejarte, es un desperdicio de tiempo y energía. Si puede hacer algo al respecto, hazlo. Si no puedes, sigue adelante. Punto. No tienes que pedir disculpas ni por ti ni por tu perro por la forma en que sois. Mientras no molesteis a nadie, podeis hacer lo que querais y ser quien quereis ser. No tienes que ser bueno en nada, como Obedience, Agility, Musical Free Style, Heel Work to Music, Flyball, Frisbee Dog, Earth Dog, Ski-Joring, Bike-Joring, Earthdog, Rally-O, Weight Pulling, Carting, Schutzhund, Herding, Nose Work, Therapy, Field Trials, Dock Dogs, Dog Diving, Disc Dogs, Ultimate Air Dogs, Super Retriever, Splash Dogs, Hang Time, Lure Course Racing, Sled Dog Racing or Treibball; y no necesitas excusarte por ello. No hay que escusarse tampoco si tu perro no sabe sentar bien. Cambia lo que quieras y puedas cambiar y no pierdas tiempo y energia pensando sobre lo que no quieres, no necesitas o no puedas cambiar. Haz lo que tu y tu perro os gusta, como querais hacerlo, asi los dos resultais contentos. Es tan simple como eso! Si no estás conforme con algún aspecto de tu vida con tu perro, haz algo para cambiarlo. Identifique el problema y establezca un objetivo, haz un plan e implementalo. Sentirse mal y culpable no ayuda a nadie—esto no te ayudara ni a ti, ni a tu perro, o los que mas quieres y con quienes compartes tu vida. La propiedad de los seres vivos es esclavitud; y afortunadamente la esclavitud ha sido abolido No te consideres como el dueño de tu perro. Piensa en tu perro como un compañero del cual eres responsable. No posees a tus hijos, tu pareja y tampoco tus amigos. Amor nada tiene que ver con la dependencia, obsesión y el deseo, sino todo lo contrario. Ame su perro, pero no creas una dependencia mutua. Tenga vida propia y dé a su perro algún espacio. Tu perro y tu sois dos individuos independientes. Disfrute de vivir juntos como personas independientes, no siendo enviciado el uno al otro. Deje de proyectarse en su perro. Un perro es un perro y en efecto es un notable ser vivo. Ámelo, disfrute de su compañía, pero no le haga un sustituto para un compañero humano, un amigo, un hijo o un cónyuge. Esperar que cualquiera pueda ser un sustituto es el mayor desrespeto que pueda cometer tanto hacia otro humano como hacia cualquier animal no humano, y a ti mismo. Dejarle cesar al perro en seguirte tu guion y comienza a amarlo como el perro que es. Todas las relaciones son intercambios: das y tomas. No hay nada malo con esto mientras hay equilibrio. Tienes que ser honesto contigo mismo: Que te da tu perro y que le das a tu perro? Si ves que uno de los dos es mayoritariamente uno que da o recibe, piensalo y reestablece el equilibrio. Tu perro te necesita tanto como tu a el, y no hay nada malo en ello, mientras los dos daís y recibís. No teneis el perro solo para salvar el pobre, pequeña criatura. Tienes el perro para que ambos podais gozar de una relacion solida y fructifera. Esto es una característica humana muy común: siempre quiere lo que no tiene y es ciego a todo el bien que realmente tiene. Tu perro ya te da muchisimo y los dos podeis ser absolutamente felices juntos, aun cuando tu perro no es particularmente bueno en algo. Es asombroso como los dueños de perros suelen decir que ellos aman sus perros y aún asi pasan la mayor parte del tiempo tratando de cambiar su comportamiento. Concéntrese en lo que tiene, no en lo que no, aprécielo y agradezelo. Hay muchas maneras de ser un buen propietario de perro y el tuyo es unico y diferente a todos los demás. Es tu vida. Mientras que no perjudique a nadie, viva en la forma que te siente bien. Escuche a expertos, reflexione sobre su consejo, pero, al final de día, haga lo que siente es correcto para tí, siga tu corazón. Here is a list of 16 things you should stop doing in order to make life with your dog happier and your relationship stronger. Difficult? Not at all. You just need to want to do it and then simply do it. You can begin as soon as you finish reading this. Like most things in life, being a perfectionist has its advantages and disadvantages. When you own a dog, you tend to live by Murphy’s Law. Anything that can go wrong will go wrong. There are so many variables that things seldom go 100% the way you expect. You can and should plan and train, but be prepared to accept all kinds of variations, improvisations and minor mishaps along the way as long as no one is injured, of course. After all, in most situations less than perfect is better than good, so why worry about perfection, a concept that only exists in your head and doesn’t make anyone happy, neither you nor your dog? If you don’t have a good sense of humor, don’t live with a dog. Dog ownership gives rise to many mishaps where laughter is the best way out. Mishaps are only embarrassing in our minds. Your dog doesn’t even know what embarrassment is and you should follow its example. As long as no one gets hurt, just laugh at you and your dog’s mistakes. When life with a dog is often dictated by Murphy’s Law, if you attempt to control your dog’s every move, you’ll end up with an ulcer or fall into a depression. Give up your need to control. Of course, you should have reasonable control over your dog for safety’s sake, but you should let go of anything that is not a matter of life or death. Reasonable rules serve a purpose, but total control is unnecessary and self-defeating. Take it as it comes and keep smiling! When things go wrong, and they will, I assure you, don’t waste your time apportioning blame. Was it your fault, the dog’s fault, or the neighbor’s cat’s fault? Who cares? Move on and, if you found the scenario all rather upsetting, try to foresee a similar situation in the future and avoid it. If it was no big deal, forget about it. The world is full of irrational, unfounded old wives’ tales. These days, the Internet provides us with quick and easy access to a lot of valuable information—and a lot of junk as well: bad arguments, bad definitions, unsubstantiated claims, fallacies, emotional statements, pseudo-science, sales promotions, hidden political agendas, religious preaching, etc. Of course, in the name of freedom of expression, I believe everyone should be allowed to post whatever they like, even the purest and most refined crap—but both you and I also have the right not to believe it, to disregard it. Use your critical thinking. Don’t stop asking yourself “How can that be?” and “How did he/she come to that conclusion?” Suspend judgment and action until you have had time to ponder on it and, if necessary, seek a second and third opinion. If the argument is sound and you like it, then do it. If the argument is sound but you don’t like it, don’t do it and think more about it. If the argument is unsound, reject it and think no more about it. Make up your own mind and do what you think is right. We are over swamped by labels because labels sell, but they only sell if you buy them. Should you be a positive, ultra-positive, R+, R++, R+P-, balanced, naturalistic, moralistic, conservative, realistic, progressive, clickerian or authoritarian dog owner? Stop caring about what label you should bear. When you enjoy a great moment with your dog, the label you bear is irrelevant. A label is a burden; it restricts you and takes away your freedom. Labels are for insecure people that need to hide behind an image. Believe in yourself, be the type of dog owner you want to be and you won’t need labels. You spend very little time with most of the people you meet, significantly more with family and close friends, but you live your whole life with yourself. So, why care about what other people think about your ability as a dog owner or your dog’s behavior, when you probably won’t see them again or will only ever see them sporadically? If they like you and your dog, fine. If they don’t, it’s really not your problem. You only have a problem when there is a discrepancy between the way things are and the way you expect them to be. If your expectations are realistic, try and do something about achieving them. If they’re not, stop complaining, it’s a waste of time and energy. If you can do something about it, do it. If you can’t, move on. Period. You don’t have to excuse yourself or your dog for the way you are. As long as you don’t bother anyone, you are both entitled to do what you like and be the way you are. You don’t need to be good at anything, whether it be Obedience, Agility, Musical Free Style, Heel Work to Music, Flyball, Frisbee Dog, Earth Dog, Ski-Joring, Bike-Joring, Earthdog, Rally-O, Weight Pulling, Carting, Schutzhund, Herding, Nose Work, Therapy, Field Trials, Dock Dogs, Dog Diving, Disc Dogs, Ultimate Air Dogs, Super Retriever, Splash Dogs, Hang Time, Lure Course Racing, Sled Dog Racing or Treibball; and you don’t need excuses as to why not. You don’t even need to excuse the fact that your dog can’t sit properly. Change what you want to change and can change; and don’t waste time and energy thinking about what you don’t want to, don’t need to or can’t change. Do whatever you and your dog enjoy, however you like, so that both you and your dog are happy. It’s as simple as that! If you’re unhappy with any particular aspect of your life with your dog, do something to change it. Identify the problem, set a goal, make a plan and implement it. Feeling bad and guilty doesn’t help anyone—it doesn’t help you, your dog, or the cherished ones you share your life with. The ownership of living beings is slavery; and thankfully slavery was abolished. Don’t regard yourself as the owner of your dog. Think of your dog as a mate you are responsible for. You don’t own your children, your partner or your friends either. Love has nothing to do with dependency, obsession and craving, quite the contrary. Love your dog but don’t create mutual dependency. Have a life of your own and give your dog some space. You and your dog are two independent individuals. Enjoy living together as free agents, not being addicted each other. Stop projecting yourself onto your dog. A dog is a dog and it is indeed a remarkable living being. Love it, enjoy its company, but don’t make it a substitute for a human partner, a friend, a child or a spouse. To expect anyone to be a substitute is the greatest disrespect you can show to a human as well as non-human animal—and to yourself. Stop letting your dog play a role for you and begin to love your dog as a dog. All relationships are trades: you give and you take. There’s nothing wrong with that as long as there is balance. Be honest with yourself: what does your dog give you and what do you give your dog? If you find that one of you is almost solely a giver or a taker, think about it and redress the balance. Your dog needs you, just as you need your dog and there’s nothing wrong with that, as long as you both are givers and takers. You didn’t get your dog just to save the poor, little creature. You got your dog so you could both enjoy a solid and fruitful partnership. This is a very common human characteristic: you always want what you haven’t got and you are blind to all the good you do have. Your dog already gives you a great deal and the two of you can be perfectly happy together, even if your dog is not particularly good at anything. It’s amazing how dog owners say they love their dogs and yet they spend most of the time trying to change their behavior. Focus on what you do have, not on what you don’t, appreciate it and be grateful for it. There are many different ways of being a good dog owner and yours is your own and different to everyone else’s. It’s your life. As long as you don’t harm anyone, live it the way that feels good for you. Listen to experts, ponder on their advice, but, at the end of the day, do what you feel is right for you, follow your heart. Be yourself. This Rottweiler female shows me friendly behavior licking my face and ear. I show that I accept her friendly behavior by turning my face away from her, closing my eyes and mouth and making champing noises. Mostly, dogs show friendly and pacifying behavior to humans as they do to other dogs (photo by Lisa J. Bain). Pacifying behavior (Latin pacificare, from pax = peace and facere, facio = to make) is all behavior with the function of decreasing or suppressing an opponent’s aggressive or dominant behavior. There are two ways of classifying pacifying behavior: (1) to include all behaviors with the function of diffusing social conflict, and (2) to restrict it to a particular range within the broader spectrum of conflict decreasing behavior (see diagram below). This author prefers the latter because the broad use of the term in the first option makes it synonymous with conflict decreasing behavior in general, without reference to any particular sub-class of this behavior. Pacifying behavior is closely related to friendly behavior (including greeting behavior), insecure, submissive and fearful behavior. In general, the differences between these behavior displays are quantitatively small, but we can classify them separately and qualitatively according to their respective sub-functions. An animal pacifies another by means of a complex sequence of different behaviors as we can see in the diagram below. An animal very seldom shows a single behavior. Also, the same behavior may achieve different functions depending on its intensity and the sum of all behaviors displayed at a given moment. Pacifying behavior did not originate as a deliberate and well-thought strategy to manipulate an opponent. Initially, it was probably just a reflex. Like all phenotypes, it happened by chance and evolved thereafter. Pacifying behavior in dogs: licking own lips, licking and pawing (images by Alanic05 and Colorado Great Pyrenee Rescue Community). Natural selection favors behaviors that prolong the life of an animal and increase its chance of reproducing; over time pacifying behavior spread throughout the population. Evolution favors a systematic bias, which moves behavior away from maximization of utility and towards maximization of fitness. Many species show pacifying displays in their behavior repertoire (photos by J. Frisch, AFP and Aleixa). The origin of pacifying behavior—Animal A facing aggressive opponent B registers (sensory system) B’s behavior, processes it (neurological system) and responds with a behavior. This behavior (probably an infantile behavior) is then registered by aggressive animal B; some behaviors tend to pacify it (probably eliciting parental behavior) while others do not. The pacified state of B benefits A and reinforces its behavior, i.e. it is likely it will repeat the same behavior in similar circumstances. Most importantly, animals that show appropriate pacifying behavior (such as A) survive conflicts and avoid injury more often than not and subsequently pass their genes onto the next generation. Pacifying behavior also pacifies the pacifier, which is an important feature of this behavior. By displaying pacifying behavior, an insecure animal attempts to regain some security (homeostasis) by displaying a behavior it knows well and has previously served to reassure it. 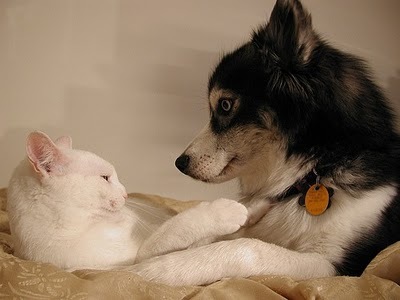 Cat and dog use the pacifying behavior of their own species to communicate with one another successfully because of the common characteristics of the behavior (photo by Malau). Some pacifying behavior has its origins in neonatal and infantile behavior and only becomes pacifying behavior through redirection and eventually ritualization. Other forms of pacifying behavior rely on concealing all signs of aggressive behavior. Sexual behavior can also function as pacifying. Young animals of social species learn pacifying behavior at a very early age; it is important that young animals are able to pacify adults when they begin interacting with them. The disposition (genotype) to display the behavior is innate (otherwise the phenotype would not be subject to natural selection and evolution), although it requires reinforcement for the young animal to be able to apply it successfully. In canines, adults (initially the mother at the time of weaning) teach the cubs/pups the intricacies of pacifying behavior, a skill they will need to master in order to prevent or resolve hostilities that could cause serious injuries. Even though pacifying behavior is more relevant and developed in social species, we also find pacifying displays in the behavior repertoire of less social species. Animals use successfully the pacifying behavior characteristic of their own species with individuals belonging to other species (if possible) because of the common elements of pacifying behavior across species. It is not unusual to see our domestic animals, dogs, cats and horses interacting peacefully and exchanging pacifying signals. Dogs also show friendly, insecure, pacifying or submissive behavior to their owners and other humans with species characteristic displays; licking, nose poking, muzzle nudging, pawing and twisting are common behaviors that dogs offer us. 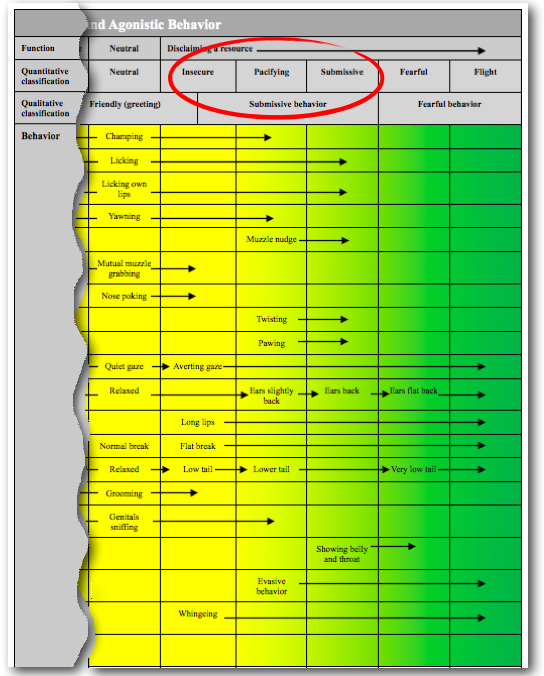 This diagram shows the placement of pacifying behavior in the spectrum of behavior in canids. The diagram does not include a complete list of behaviors. A conflict is any serious disagreement, dispute over a resource, which may lead to one or both parts showing aggressive behavior. Resources are what an organism perceives as life necessities, e.g. food, mating partner, or a patch of territory. What an animal perceives to be its resources depends on both the species and the individual; it is the result of evolutionary processes and the history of the individual. The spectrum of pacifying behavior in canids (by R. Abrantes). The colored background illustrates and emphasizes that behavior is a continuum with fading thresholds between the various behaviors. The vertical lines are our artificial borders, a product of definition and convention. 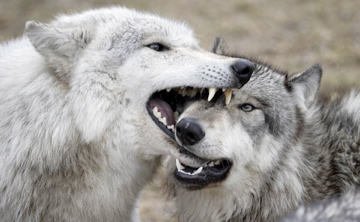 Muzzle grab in adult wolves (photo by Monty Sloan). 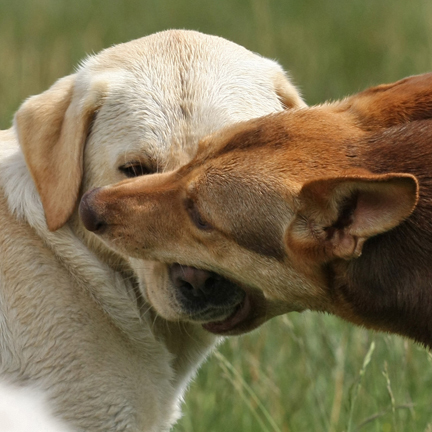 Dogs also show the muzzle grab behavior (photo by Marco de Kloet). When used as a means of settling a dispute, a muzzle grab looks more violent and normally ends with the muzzle-grabbed individual showing passive submissive behavior. However, the participants very seldom get hurt, an occurrence that would counteract the function of the behavior itself. 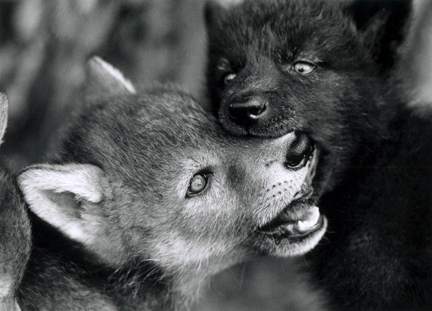 Cubs and pups muzzle grab one another during play (photo by Monty Sloan). A muzzle grab requires self control. Higher ranking wolves and dogs muzzle grab their pack members (team mates) and by doing so confirm their rank and display self control. Lower ranking wolves and dogs invite muzzle grabbing behavior in order to confirm their acceptance of their social position and to reassure themselves that they are still accepted. The muzzle grab behavior probably originated as both a form of maternal (and later paternal) behavior and as a play behavior amongst cubs. As it proved beneficial to all concerned, it became a factor for natural selection and spread from generation to generation, evolving in the same way as any other trait that increases the fitness of an individual. In domestic dogs, when the puppies are five to seven weeks old, their mother muzzle grabs them regularly. At first, their mother’s behavior frightens them and they may whimper excessively, even if the mother has not harmed them in any way. Later on, when grabbed by the muzzle, the puppy immediately shows passive submission (lies down with its belly up). Previously, it was assumed that the mother needed to pin the puppy to the ground, but this is not the case as most puppies submit voluntarily. Over time, this behavior pattern assumes variations. Wolf cubs and puppies often invite the alpha male (leader of the pack) as well as other adults to grab them by the muzzle. They solicit a demonstration of their elders’ superiority and self control, whilst at the same time they show their acceptance and submission. This is the most reassuring behavior an adult dog can show a puppy. The muzzle grab behavior can be difficult to classify. Some researchers classify it as social behavior, others as agonistic behavior and a third group places it in the distinct category of pacifying behavior. Since the function of this behavior is primarily to confirm a relationship between two individuals, this author classifies it as social behavior. Stable and profitable relationships are not built in the long run by means of a series of dominant and submissive displays. Instead, these behaviors are necessary for resolving inevitable social conflict. Both humans and dogs (and wolves, of course) build relationships on the need for partnership in overcoming common problems related to surviving and, preferably, achieving an acceptable level of comfort. Relationships are not built on hierarchies, but they do exist and they do play an important role in certain circumstances—for humans as well as dogs (and wolves of course)—sometimes more, sometimes less and sometimes not at all. Illustration showing the possible combinations of aggressive, fearful, dominant and submissive behavior in social canines (From “Dog Language” by Roger Abrantes, illustration by Alice Rasmussen). Copyrighted illustration. In everyday language,dominance means “power and influence over others.” It means supremacy, superiority, ascendancy, preeminence, predominance, mastery, power, authority, rule, command and control. The word has so many meanings and connotations that we cannot simply pick a dictionary definition and employ it as a scientific term in the behavioral sciences. Terms need to be accurately defined in order to avoid misunderstandings, meaningless discussions and nonsensical claims. Unfortunately, the scientists who use this term (as well as those who repudiate it) have not managed to define it satisfactorily, thus contributing to the current confusion about the nature and function of dominant behavior. (4) arguing that, even though it is true that a good (in terms of being profitable and stable) relationship does not rely on continuous displays of dominance/submission from the same individuals toward the same other individuals, this does not imply that dogs cannot show dominant behavior. Denying that dominant behavior exists in dogs has become a popular argument to defend the claim that we must not use ‘dominance’ to build a relationship with our dog. Indeed, the discussion on dominance has run away with us; and there is only one thing more absurd and futile than attempting to prove that dominant behavior exists and that is attempting to prove that dominant behavior does not exist. In the following, I shall commit the first of these futile acts. In a stable pack, wolves mostly display dominant and submissive behavior and seldom aggressive and fearful behavior. It is absurd to argue that dominance (as an attribute, a property) does not exist when there are so many words for it, depending on context and nuance. If it didn’t exist, neither would these terms. The numerous synonyms and connotations suggest, not only that the term is hard to define, but also that a property of behavior has been observed whose features are sufficiently dissimilar to other properties to make it worth classifying and naming. Whether or not the name or names given are appropriate or well defined is another story, and has no influence whatsoever on the behavior in question. We can argue that this attribute (dominance) has been observed and that (1) it only refers to particular human relations, or that (2) it refers to particular relations among humans as well as some other animal species. The second option seems more appealing, considering that it is highly improbable that a particular condition would only exist in a single species. This would go against all we know about the relatedness and evolution of species. However, there is nothing implausible about stating that the term does not apply to describe the behavior of a particular species. On the contrary, two species that diverged from a common ancestor billions of years ago have evolved and developed characteristics of their own and now differ, both from the common ancestor and from one another. By the same token, closely related species, which diverged from a single common ancestor a few thousand years ago, will show various characteristics, similar or equal to the common ancestor and to one another. Some species share many common attributes in terms of phenotype, genotype and behavior, others less, some none at all. It all depends on their common ancestry and their adaptation to the environment. 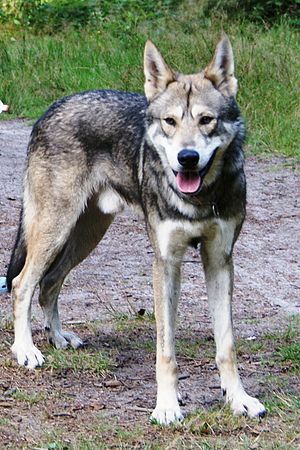 Wolf-dog hybrid (Image via Wikipedia). Humans and chimpanzees (Homo sapiens and Pan troglodytes) diverged from a common ancestor about 6 million years ago, so we can expect them to have fewer common attributes than wolves and dogs (Canis lupus lupus and Canis lupus familiaris) which only diverged from a common ancestor about 15 to20 thousand years ago according to recent studies (and by no means, more than 100 thousand years ago). The DNA of humans and chimpanzees differs to a greater degree than that of wolves and dogs (which is almost identical except for a few mutations). Humans cannot interbreed with chimpanzees; wolves and dogs can interbreed with each other and produce fertile offspring. Humans and chimpanzees are two completely distinct species. Wolves and dogs are two sub-species of the same species. These facts considered, we could expect wolves and dogs to show a great number of similarities, which indeed they do, not only physically but also behaviorally—and any laymen will attest to that. Their similarities on certain levels are what makes it possible for them to mate, produce fertile offspring, and communicate. Nobody questions that wolves and dogs have a very large, common repertoire of communication behaviors; and rightly so, for multiple observations have confirmed that they do communicate perfectly well. Their facial expressions and bodily postures are remarkably similar (except for a few dog breeds) with only a few small differences, these being smaller than cultural differences between humans from some geographically separated settlements. If wolves and dogs can communicate, it follows that the basic and crucial elements of their languages must be the same. This means that even though they evolved in apparently distinct environments, they retained the most anchored elements of their genotypic characteristics. This could be for the following reasons: (1) the common genotypes are vital to the organism, (2) the environments were not so crucially distinct after all, (3) evolution needs more time and more selective conditions (since it operates on phenotypes) for the genotypes to begin to differ radically. Point (1) above means that there are more ways of not being alive than being alive, or, in other words, that evolution needs time to come up with different, viable life forms. Point (2) means that even though wolves and (pet) dogs now live in completely different environments, the phenomenon is still too recent. It is only in the last century that dogs became so overly domesticated. Until then, they were our companions. They were domestic animals that still maintained a high degree of freedom and depended (mostly) on the same successful selective factors as always. They were still not pets and breeding was not totally (or almost totally) controlled by human selection. Point (3) means that we might one day (in a million years or so) have two completely distinct species: wolves and dogs. By that time, they will not mate, will not produce fertile offspring and will perhaps show some completely different characteristics; and we may change the dog’s name to Canis civicus, or Canis homunculus. However, we are not there yet! Recent trends claim that “dominant behavior” does not exist in dogs, which poses some serious problems. There are two ways to argue in favor of such thinking. One is to dismiss “dominant behavior” outright, which is absurd as, for the aforementioned reasons, the term does exist, we know roughly what it means and we use it in conversation. It must, therefore, refer to a class of behaviors that we have observed. Another argument is to claim that wolves and dogs are completely different and therefore, even though we can apply the term to explain wolf behavior, we cannot use it to describe dog behavior. If they were completely different, the argument would be valid, but they are not, as we have seen. On the contrary, they are very similar. A third alternative is to propose a brand new theory to explain how two such closely related species, as the wolf and the dog (actually sub-species), can have developed in such a short period (thousands of years) with so many radically different characteristics in one aspect, but not in others. This would amount to a massive revision of our entire body of biological knowledge, with implications far beyond wolves and dogs—an alternative I find unrealistic. A far more appealing approach, it seems to me, is to analyze the concepts we use and define them properly. This would allow us to use them meaningfully when dealing with different species without running into incompatibilities with the entire body of science. An accurate definition of “dominant behavior” is important because the behavior it encompasses is crucial to the survival of a certain type of individuals, as we shall see. To dismiss the existence of facts underlying a term, just because that term is ill-defined, not to mention politically incorrect (which means that it doesn’t suit our immediate goals) seems to me to be a poor approach. Dominant behavior exists, but it is badly defined (when defined at all). Most discussions involving dominant behavior are meaningless because none of the parties know what exactly the other is talking about. However, we don’t need to throw the baby out with the bath water! Therefore, I suggest precise definitions of dominant behavior and the terms we need to understand: what it is, what it is not, how it evolved and how it functions. Resources are what an organism considers to be life necessities, e.g. food, mating partner, or a patch of territory. The perception of what an animal may consider a resource is species as well as individual related. Aggressiveness (aggressive behavior) is behavior directed toward the elimination of competition while dominance, or social-aggressiveness, is behavior directed toward the elimination of competition from a mate. Mates are two or more animals that live closely together and depend on one another for survival. Aliens are two or more animals that do not live closely together and do not depend on one another for survival. Dominant behavior is particularly important for social animals that need to cohabit and cooperate to survive. Therefore, a particular social strategy evolved with the function of dealing with competition among mates, whilst conferring greatest benefit at the least cost. Animals show dominant behavior with various signals: visual, auditory, olfactory and/or tactile. While fearfulness (fearful behavior) is behavior directed toward the elimination of an incoming threat, submissive, or social-fearfulness, is behavior directed toward the elimination of a social-threat from a mate, i.e. losing temporary access to a resource without incurring injury. A threat is a stimulus that most often precedes a behavior that may harm, inflict pain or injury, or decrease an individual’s chance of survival. A social-threat is a threat (a threatening behavior) from another individual or group of individuals that may cause submissive behavior or flight resulting in the temporary loss of a resource, but not injury. Animals show submissive behavior by means of various signals: visual, auditory, olfactory and/or tactile. Persistent dominant or submissive behavior from the same individuals toward the same other individuals may or may not result in a temporary hierarchy of a certain configuration, depending on species, social organization and environmental circumstances. In stable groups confined to a defined territory, temporary hierarchies will develop more readily. In unstable groups under changing environmental conditions or, in undefined or non-established territories, hierarchies will not develop. Hierarchies, or rather the strategies involved, are Evolutionarily Stable Strategies (ESS), which are always slightly unstable, swinging forth and back around an optimal value, depending on the number of individuals in the group and the strategy each individual adopts at any given time. Hierarchies are not necessarily linear, although in small groups and over time, non-linear hierarchies seem to have a tendency to become more linear. Some individuals have a stronger tendency to show dominant behavior and others to show submissive behavior. This may depend on their genetic makeup, early learning, experience, etc. There is no one single factor to determine this, rather a complex mixture. Let us call this a natural tendency; this is not to say it is not modifiable. It is a fact that some individuals can be more assertive than others, while others can be less so. Neither is ‘good’ or bad’ in a moral sense, simply more or less advantageous, depending on context. In one-to-one encounters, all things being equal, individuals are more likely to adopt the strategy they feel most comfortable with, hence maintaining their history of mostly displaying dominant behavior or mostly displaying submissive behavior. When in a larger group, they will have the same tendency to play the roles they feel most comfortable with. However, this may change due to the accidental makeup of the group. Imagine a group with a large proportion of individuals that are prone to showing submissive rather than dominant behavior, and with only a few members showing the opposite tendency. In this scenario, an individual with a tendency to mostly show submissive behavior would have more chance of gaining access to resources by showing more dominant behavior and being successful. Success breeds success and, progressively, this individual with a tendency to display submissive behavior finds itself more frequently opting for a dominant strategy. If the scenario gives rise to an individual changing its preferred strategy, then others will also have the same opportunities. The number of individuals showing dominant behavior will increase, but only to a certain point, as the group cannot sustain too large a number of individuals adopting a dominant strategy. In order to avoid the risk of injury, it will eventually be more advantageous to adopt a submissive strategy, depending on benefits and costs. Therefore, the number of dominant and submissive individuals in a group (which means individuals adopting one or other strategy as their preference) depends, not only on the natural tendency of the individuals, but also on the proportions of behavioral strategies within the group. Whether it pays off to play a dominant or a submissive role is ultimately a function of benefits and costs and the number of individuals that adopt one particular strategy. Understanding the relationship between dominant and submissive behavior as an ESS (Evolutionarily Stable Strategy) opens up exciting perspectives and could help us to explain the behavior adopted by any given individual, at any given time. An individual will learn to display submissive behavior toward the more dominantly acting ones, and display dominant behavior toward the more submissively acting. This means that no individual always behaves dominantly or submissively as a principle, instead it all depends on the opponent and, of course, the value of the potential benefits and estimated costs. As a corollary, hierarchies (when they exist) will always be slightly unstable depending on the strategies adopted by the individuals in the group; and they won’t be linear except in small groups or sub-groups. In the opinion of this author, the mistake we have committed hitherto has been to regard dominance and submission as more or less static. We haven’t taken into account that these behavioral characteristics, like phenotypes and all other traits, are constantly under the scrutiny and pressure of natural selection. They are adaptive, highly variable, and highly quantitative and quantifiable. As such, dominance and submission are dynamic features depending on different variables, a view which is compatible with the development of behavior at individual level, genetic functions, the influence of learning and, not least, evolutionary theory. Dominance and submission are beautiful mechanisms from an evolutionary point of view. They enable (social) animals to live together and survive until they reproduce and pass their (dominant and submissive behavior) genes to the next generation. Without these mechanisms, we wouldn’t have social animals such as humans, chimpanzees, wolves and dogs to name just a few. If an animal resolves all inter-group conflicts with aggressive and fearful behavior, it will be exhausted when subsequently compelled to go and find food, a mating partner or a safe place to rest or take care of its progeny (all of which decrease the chances of its own survival and that of its genes). Thus, the alien and mate strategy originated and evolved. It is impossible to fight everybody all of the time, so a mate is confronted using energy-saving procedures. Submissive and dominant behavior also control population density, since they rely on individual recognition. The number of individuals an animal is capable of recognizing must have a limit. If this number exceeds a certain level, it makes recognition inefficient and impedes the alien/mate strategy; fearful/aggressive displays then replace submissive/dominant behavior. The strategy of submission is sound. Instead of vainly engaging in a desperate fight, waiting may prove more rewarding. By employing pacifying and submissive behavior, subordinates are often able to shadow dominantly behaving animals and profit from opportunities to gain access to vital resources. By showing submissive behavior, they retain membership of the group, which also confers several advantages—particularly defense against rivals. Hierarchies work because a subordinate will often move away, showing typical pacifying behavior, without any obvious signs of fear. Thus, the higher ranking animal may simply displace a lower ranking when feeding or at a desirable site. Hierarchies in nature are often very subtle, being difficult for an observer to decipher. The reason for this subtlety is the raison d’être of the dominance-submission strategy itself: the lower ranking animal (adopting the submissive strategy) generally avoids encounters and the higher ranking (adopting the dominance strategy) is not too keen on running into skirmishes either. Fighting involves a certain amount of risk and can lead to serious injury, or even death. Evolution, therefore, shows a tendency towards favoring and developing mechanisms, which restrain the intensity of aggressive behavior. Most species have clear signals that show acceptance of defeat and end combat before injury occurs. Sign-stimuli are the stimuli that produce an instinctive behavior sequence. To recognize sign-stimuli is life saving for the infant immediately after birth. Compromise is the most relevant lesson a social youngster may learn after the fundamental life saving sign-stimuli. It maintains the fitness of a group. Natural selection has proved this, favoring the individuals that develop behavior that enables them to stay together—when they need to stay together for better survival. Other animals, e.g. the solitary predators, do not need such social traits. These organisms found other ways of dealing with the maintenance of their metabolism and reproduction. Learning to be social means learning to compromise. Social animals spend vast amounts of time together and conflicts are inevitable. It is crucial for them to develop mechanisms to deal with hostilities. Limiting aggressive and fearful behavior by means of inhibition and ritualization is only partially safe. The more social the animal is, the more efficient its mechanisms for avoiding injury need to be. Inhibited aggression is still aggression; it is playing with fire on a windy day. It works well for less social or less potentially aggressive animals, but highly social and potentially aggressive animals need other mechanisms. The significant difference between the two types of aggressive behavior seems to be the function. Aggressiveness deals with the alien and social-aggressiveness with the mate. Conversely, fear and social-fear deal with alien and mate. These are qualitative differences that justify the creation of new terms, hence dominance and submission. What does this mean for our understanding of our dogs and our relationship with them? This means that we all show dominant (self-confident, assertive, firm, forceful) behavior as well as submissive (insecure, accepting, consenting, yielding) behavior depending on many factors, e.g. state of mind, social position, resources, health status, opponent—humans as well as dogs (and wolves of course). There’s nothing wrong with it, except when we show dominant behavior where it would be more advantageous to show submissive behavior and vice versa. Sometimes we may act more dominantly or submissively and other times, less so. These are highly quantitative and quantifiable behaviors, with many variables. There is not one single, correct strategy. It all depends on flexibility and the strategy adopted by others. We build our particular (good) relationship with our dogs on partnership. We need them because they give us a sense of accomplishment that we don’t seem to get anywhere else. They need us because the world is overpopulated, resources are limited and an owner provides food, protection, healthcare, a safe place and companionship (they are social animals). It’s too hard to be a little dog all alone out there in the big world! Sometimes, in this relationship, one of the parties recurs to dominant or submissive behavior and there’s nothing wrong with that, as long as they do not both show the same behavior at the same time. If both recur to the same behavior, they have a problem: they either run into a conflict that they will usually solve without injury (the beauty of the mechanisms of dominance and submission), or one of them will have to get his act together and find the bearings for both. A good relationship with our dogs does not involve any mysterious mechanisms. It’s basically the same as with all good relationships, whilst taking into account the particular characteristics of the species and individuals involved. We don’t need any new terms. We don’t need any new theories to explain it. We aren’t, after all, that special, nor are our dogs. We are all built from the same concept and with the same basic ingredients. All we need are good definitions and a less emotional, more rational approach. Use your heart to enjoy your dog (and life), and your reason to explain it (if you need to), not the other way around. If you don’t like my definitions, feel free to come up with others which are better (with more advantages and less disadvantages), but don’t waste your time (or anyone else’s) on meaningless discussions and knee-jerk reactions. Life is precious and every moment wasted is one less bite of a cake that you’ve devoured without even realizing it. That’s how I see it and it looks beautiful to me—enjoy your cake! Creel, S., and Creel, N. M. 1996. Rank and reproduction in cooperatively breeding African wild dogs: behavioral and endocrine correlates. Behav. Ecol. 8:298-306. Estes, R. D., and Goddard, J. 1967. Prey selection and hunting behavior of the African wild dog. J. Wildl. Manage. 31:52-70. Eaton, B. 2011. 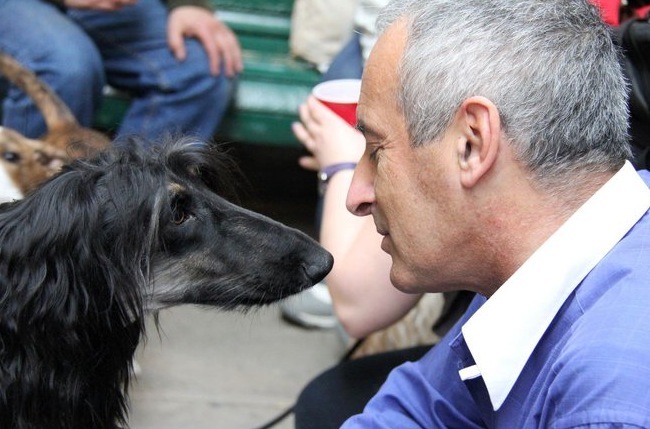 Dominance in Dogs—Fact or Fiction? Dogwise Publishing. Fentress, J. C., Ryon, J., McLeod, P. J., and Havkin, G. Z. 1987. 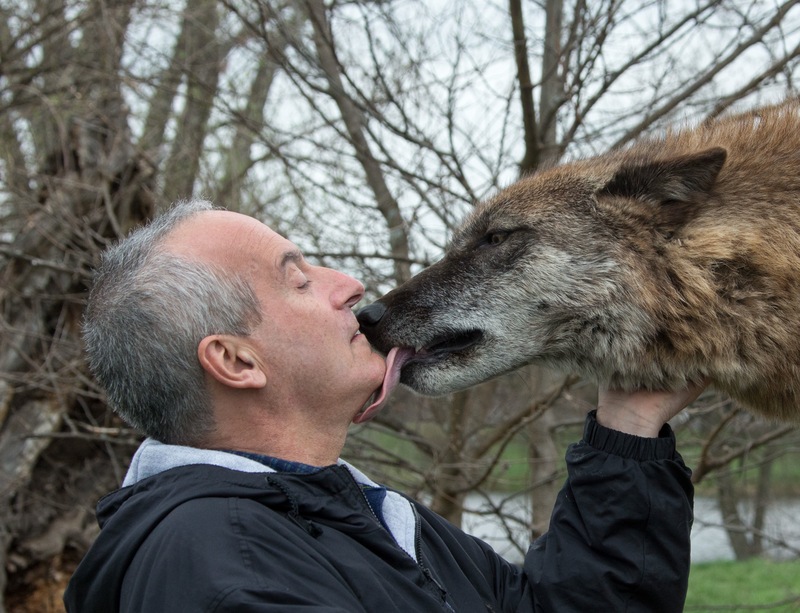 A multi- dimensional approach to agonistic behavior in wolves. In Man and wolf: advances, issues, and problems in captive wolf research. Edited by H. Frank. Dr. W. Junk Publishers, Boston. Fox, M. W. 1971. Socio-ecological implications of individual differences in wolf litters: a developmental and evolutionary perspective. Behaviour, 41:298-313. Lockwood, R. 1979. Dominance in wolves–useful construct or bad habit. In Symposium on the Behavior and Ecology of Wolves. Edited by E. Klinghammer. Packard, J. M., Mech, L. D., and Ream, R. R. 1992. Weaning in an arctic wolf pack: behavioral mechanisms. Can. J. Zool. 70:1269-1275. O’Heare, J. 2003. Dominance Theory and Dogs. DogPsych Publishing. Rothman, R. J., and Mech, L. D. 1979. Scent-marking in lone wolves and newly formed pairs. Anim. Behav. 27:750-760. Schenkel, R. 1947. 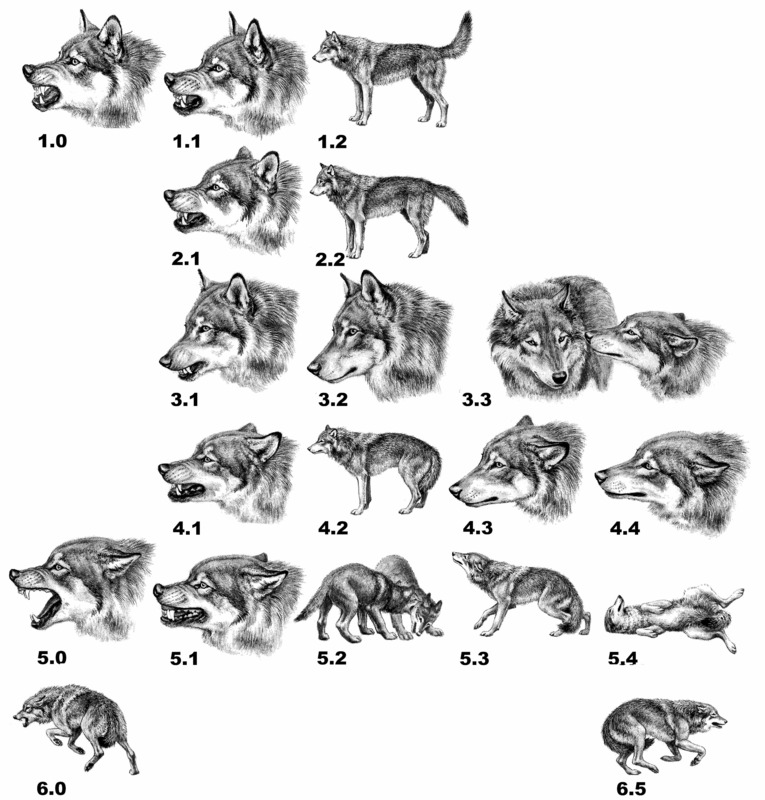 Expression studies of wolves. Behaviour, 1:81-129. Van Hooff, J.A.R.A.M., and Wensing, J.A.B. 1987. 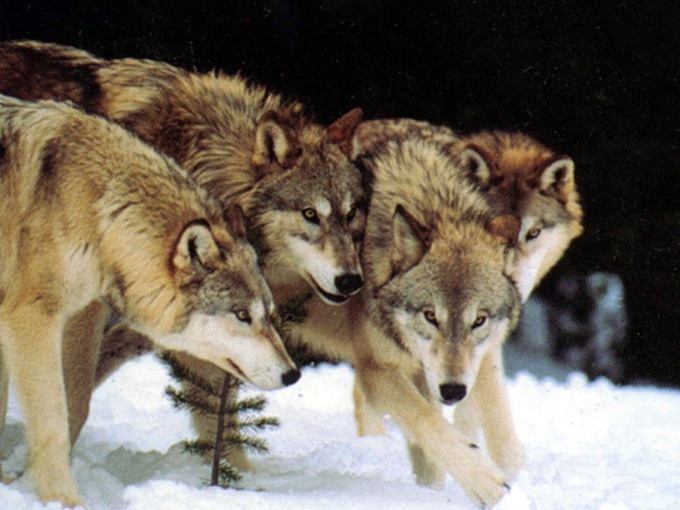 Dominance and its behavioral measures in a captive wolf pack. In Man and wolf: advances, issues, and problems in captive wolf research. Edited by H. Frank. Dr. W. Junk Publishers, Boston. Zimen, E. 1976. On the regulation of pack size in wolves. Z. Tierpsychol. 40:300-341. Zimen, Erik (1981). The Wolf: His Place in the Natural World. Souvenir Press. Thanks to Simon Gadbois (merci), Tilde Detz (tak), Victor Ros (gracias), Sue McCabe (go raibh math agate), Parichart Abrantes (ขอบคุณครับ) and Anna Holloway (thank you) for their suggestions to improve this article. The remaining flaws are mine, not theirs.